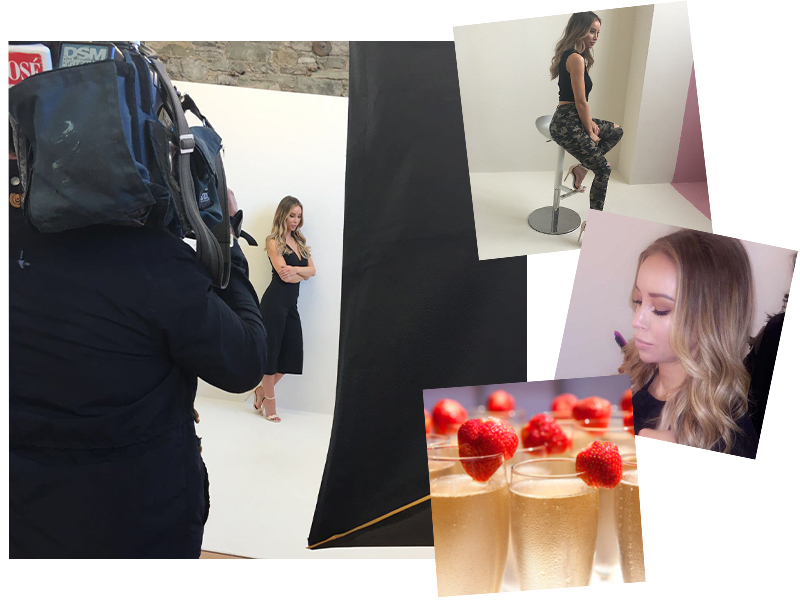 Grab an exclusive look behind the scenes at our shoot with Lauren Pope + VVV. Lauren looked hotter than ever bringing her edgy twist to that femme vibe the only way the LP can. Seriously, we had MAJOR hair and beauty envy so the crew hit her up for a few top tips. So, if you want to get one step closer to looking even a tiny bit Lauren, she raves about NARS Radiant Creamy Concealer and maybe a little Snapchat filter from time to time 😉 Obvs as founder of Hair Rehab London those locks were just so perfect. Our girl Lauren knew she was in luuurve with VVV when the champagne brunch arrived at 11am!! The Xposé crew popped in to say hi and film a bit of the shoot and Lauren did not disappoint. We’re talkin’ badass bodycons and super sophis jumpsuits, cute leather minis with rock tees and bomber jackets, co-ords and heels to seriously crush on.